Contemporaneous with the Eiffel Tower and using the same building techniques and materials (puddled iron), the Colbert Bridge is the last large swing bridge still operating in Europe with its original system of hydraulic pression. Designed by the engineer Paul Alexandre and opened in 1889, the bridge is the longest of its kind with a 70,5-metre-long roadway. The operating cabin, outlined by the architect Jean Prouvé, is an elegant complement to the very characteristic silhouette of the bridge and is also of historic and aesthetic interest. 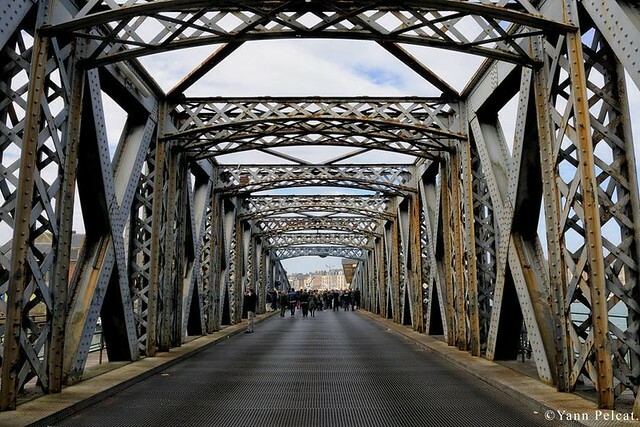 The Colbert Bridge is the only link between Deppe’s historic centre and the harbour neighbourhood of Le Pollet, being crossed by 12,000 vehicles and 1,800 pedestrians every day. The Colbert Bridge is representative of the most advanced techniques in metal construction and mechanisation of its time. Although there is no worldwide inventory of surviving swing bridges, the Colbert Bridge is undoubtedly a rare – perhaps even unique – example, and one that continues to operate in an entirely satisfactory manner. Despite its industrial heritage importance, the Syndicat Mixte du Port de Dieppe (SMPD), which owns and has administrative responsibility for the bridge, has carried out only minor maintenance and the bridge hasn’t had its metal structure painted for 18 years. This has resulted in some deterioration, but the damage is reversible as demonstrated by a study published in 2012 by the French Railways (SNCF) Engineering Structures Department. The original hydraulic mechanism is functioning and performs on average four rotations per day. However, it is not under preventative maintenance and needs to be restored. In December 2014, the SMPD decided to replace the bridge with a new structure, thus placing the Colbert Bridge under imminent threat of destruction. With the support of the local Mayor, Dieppe’s Colbert Bridge Protection Committee requested the inclusion of the bridge on the Supplementary Inventory of Historic Monuments by the French Ministry of Culture. Backed by experts, the Committee has demonstrated not only that the bridge’s restoration is technically and financially feasible, but also that this could be carried out at a considerably lower cost than the plan put forward by the SMPD. The Fondation du Patrimoine, which nominated the site for ‘The 7 Most Endangered’ programme 2016, proposes the classification of the Colbert Bridge as a Historic Monument and the commission of a study by independent experts comparing the pros and cons of the two proposals; and, depending on the outcomes of the study, the restoration of the bridge and the modernisation of its mechanism with a view to achieving a level corresponding to contemporary standards and reducing operating costs. It is perhaps worth comparing the Dieppe bridge with the slightly earlier Tyne swing bridge in Newcastle, England. This is a centrally pivoted swing bridge, so not identical to the one in Dieppe which is asymmetrical, but the significance of the comparison is that the Newcastle swing bridge, listed at grade II* in 2004, is now an essential component of the city’s identity and a tourist attraction in its own right: a model for the Colbert bridge at Dieppe?